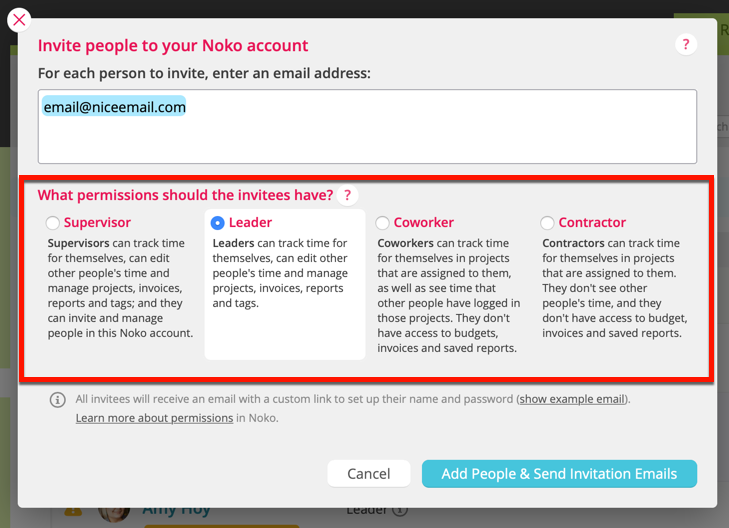 Only the account owner and supervisors can invite people to a Noko account. Learn about permissions in Noko. 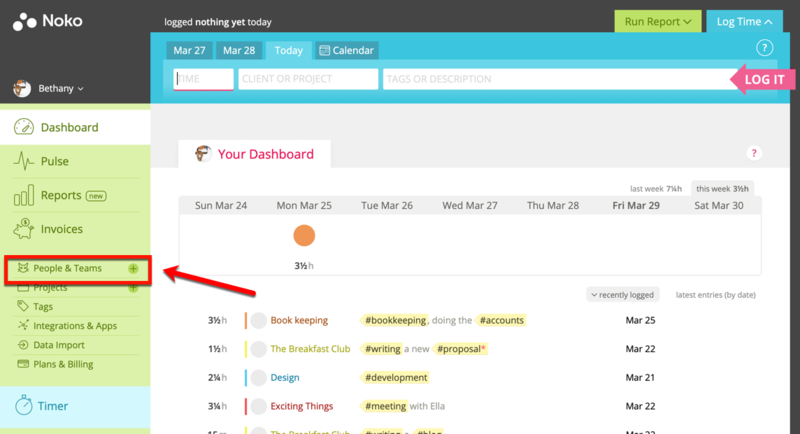 Go to the People & Teams tab in the green navigation sidebar on the left side of your screen. Here you'll see a list of all of the currently active members of your team. Click the + invite people button in the top right hand corner. A dialog will appear where you can add email addresses of people you want to invite. 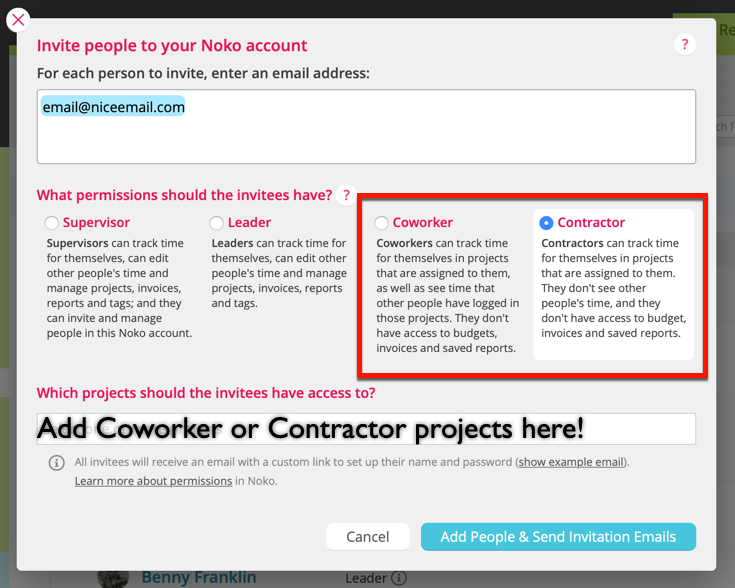 You can invite as many people to your Noko team as you'd like by entering their email addresses, separated by commas. You'll also choose what permissions your new team members will have by designating if the they are a Supervisor, Leader, Coworker, or Contractor. After you click the Add People & Send Invitation Emails button, the new team members will be immediately be available in your list of active members! All your new team members will receive an invitation email with the subject line "You're invited to Noko!". This email contains a personalized link to set up their password. This link only works once and is different for each invitee. Because Noko stores passwords in encrypted form, they can't be sent by email and need to be set before logging in for the first time. 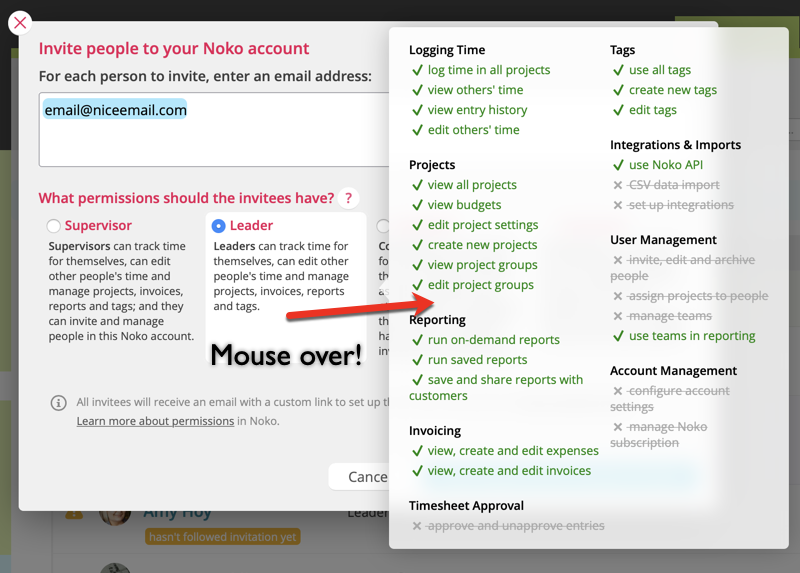 Noko will guide new users through this process so you don't have to do anything! If you add a name to the emails in the list of people you invite, Noko also stores any first and last name given (this happens when you enter an email address like this: "Thomas Fuchs <[email protected]>"). The fields will be pre-filled when these people sign in for the first time. When you invite people, your monthly billing amount might change depending on your Noko subscription plan. Please see the Plans & Billing tab in the green sidebar navigation for details on your plan.